Made some time to do some of my slab pots with textured paper gift wrap I bought several years ago. 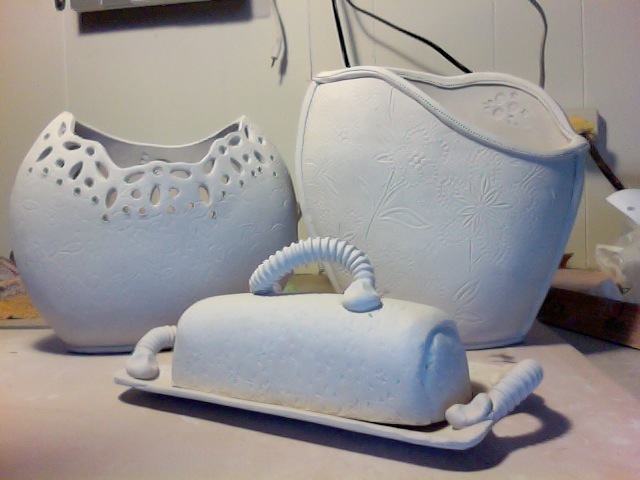 It was too pretty to use but not to immortalize in clay. Sandi Pieranatozzi had some textured paper samples and I realized I had a use for that paper! I can't wait to glaze them with the fiesta colors. Having plenty of work is an amazing thing! BUT, doesn't leave much time for blogging or making inspired work from the Sandi and Neil workshop I just attended last week. http://sandiandneil.com/gallery/ Have to check out New Day Pottery for those details. Their glazes and clay is right in line with my fiesta work and I can't wait to use some of their techniques!